The Passives are finally getting some love instead of just being 1 level stronger than attacks. But rip the previous tier-system fevers followed; they are now all their own thing. Rip how powerful the shield was (was 2872). But, to be fair, the shield’s ability was a lot more useful than thin’s. Also, this was fun to notice. This typo got me stuck for a few minutes, constantly redoing my math wondering how I got something wrong. Come to find out, was a mistake on the dev’s part. OMG. Double is finally being seen as the weapon with less utility. Finally some divide. Multi Shot: 306 Attack, 2144 Defense. Double Shot: 337 Attack, 2144 Defense. Previously, this guide was made to compare every Module/Power once upgraded to an equal level. As of Update 1.5.0, these levels no longer exist - instead opting to put every power on an equal playing field by default. Values are now updated to their new percentage format, and the section of the page that previously discussed how stats were being calculated now focuses on a new mechanic: how defensive modules now interact. Stats updated for Update 1.5.1. Mostly minor stat changes, with the exception of a few defensive modules that got changed by more than a single percent. I’m wondering if I should continue bumping this thread after every update or just let the edits speak for themselves; or maybe even refrain from bumping unless more major changes are made. Those of you who use this guide, do you wait on these bumps or just randomly check? In this update, they changed a couple Power names: like L.A.S.R. to Laser, or Lo/Rez to Low-res. Not that exciting a reason for an update, but still updating regardless, for consistency. A good amount of defensive items got a fairly beefy buff; for instance, Thin from 31% to 62% Defense. If you’re interested in playing with defensive items now, there’s a small section at the bottom of the forum with more details on how they stack. For a quick example as of this update, Thin + Shield would defend roughly 77.3%. Drawback of course being you can’t steal back. Idk why, but this update’s patch notes seem to pretend 1.6.3 didn’t really happen, saying thin was only now buffed from 31 to 50, saying trigger was nerfed instead of buffed, missing many that were changed, etc. As a result, the stat changes are more subtle than what the patch notes lead you to believe. 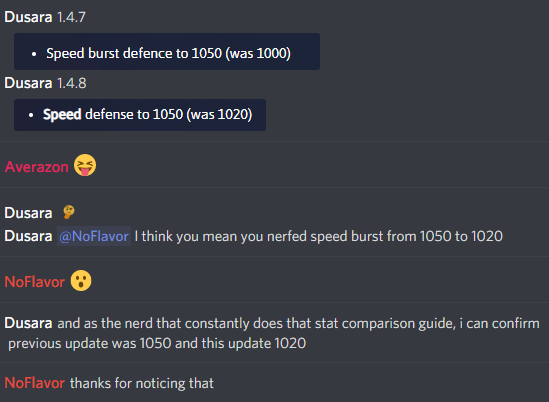 The only stats getting a significant change are again defensive items, thin being nerfed from 62 to 50, shield being buffed from 39 to 50, angles from 31 to 42, etc. Defensive modules got buffed across the board, including that annoying speed burst. Get ready for more random speed+zapping try-hards. Everything else is just minor stat changes. All defensive powers were put at a flat 30%, including that speed burst that I still argue is used more offensively than it is defensively. Since they’re now all the same, wearing any two of these defensive powers will give you a 49% defense; but let’s be honest, you’re gonna wear the speed boost and a 20%+ damage weapon. but let’s be honest, you’re gonna wear the speed boost and a 20%+ damage weapon.